It is a wonderful thing to wake up each morning and be excited about the day ahead at work. Oftentimes, what is especially valuable to the work experience in addition to the type of work we are doing, is the people who we work with. Company culture is becoming increasingly important now that millennials make up the majority of the workforce in the US. In previous generations, it was the norm to stay with the same company throughout one’s entire career—this is no longer the case. Employees are placing more value on the sense of community they are able to find in the workplace. Employee bonding is a great way to build community in the workplace, thereby improving company culture. Not only can spending time with your coworkers outside of work be fun, it can also help improve work-related outcomes. For example, getting to know your coworkers in a different context can help you better understand who they are as people, which in turn can help you appreciate their working style. Employee bonding fosters a motivation and team spirit and encourages collaboration and creativity. This contributes to improved communication and working better together in the workplace. And of course, when you enjoy the presence of the people you work with, your morale increases, allowing you to produce better work. It is worthwhile for companies to invest resources in employee bonding activities, such as family picnics, bowling nights, concerts, or pub crawls. 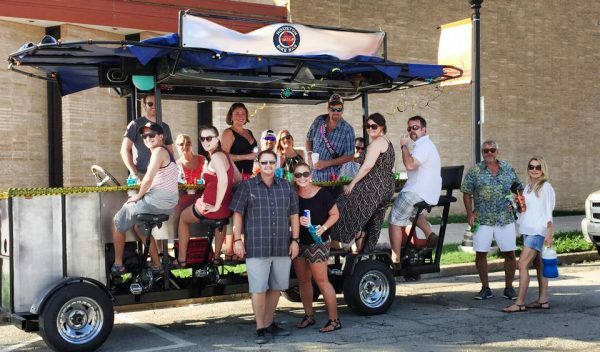 If you are at a loss for ideas for your next company outing, consider Houston Bike Bar Tours. Each Party Bike can accommodate up to 16 people. We offer tours of Main Street and the EADO District, or you can design a custom tour of the city. Regardless of which option you choose, you are guaranteed an unforgettable experience. Contact us now to book a tour.